The Amprobe Proinstall-75 Multifunction Tester and EV-520-UK Electric vehicle charging station tester. and a compact, ergonomic design, this tester is comfortable enough to use for all day testing. Beha-Amprobe® has introduced the ProInstall-75-UK Multifunction Installation Tester for fast, easy testing. With new advanced features, it is the perfect installation testing tool for verifying the safety of electrical installations in domestic, commercial, and industrial applications. It ensures that fixed wiring is correctly installed and compliant with IEC 60364, HD 384 requirements and all relevant local standards including BS7671 17th Edition wiring regulations. The Beha-Amprobe ProInstall-75-UK is efficient to use as it allows the user to measure loop impedance without tripping RCDs, eliminating the need to bypass them. Slim reach probes allow the user to keep their eyes on the panel while probing hard-to-reach areas. With easy-to-operate controls, a large display with a wide viewing angle, padded neck strap, and a compact, lightweight, ergonomic design, the tester is comfortable to use for all day testing. For testing Automotive charging stations. 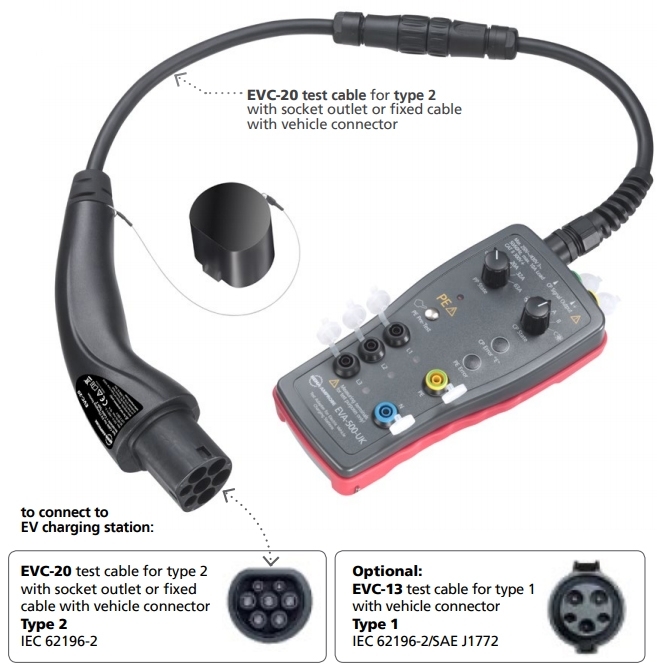 Includes the new EV-520-UK Test Adapter Kit. With this combination of high-quality instruments you can test function and safety of charging stations mode 3 for AC charging. The EV-500 Series Test Adapter Kits are designed to test function and safety of charging stations mode 3 for AC charging. 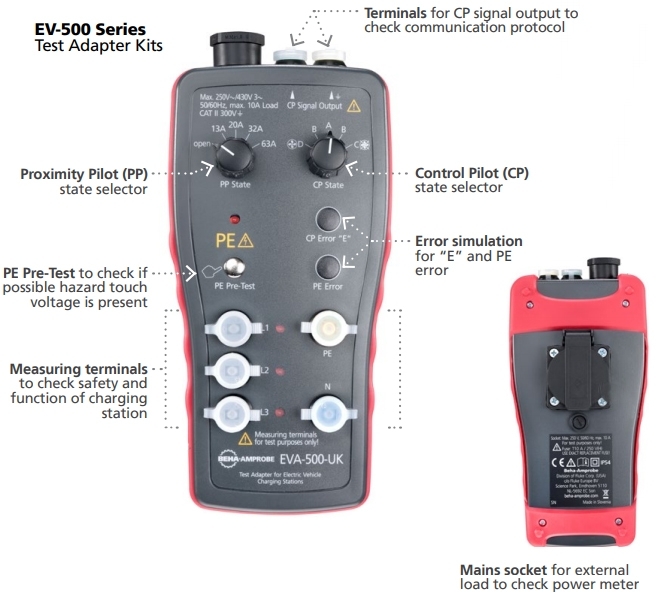 The Adapter Kit allows you to conduct tests in combination with appropriate test instruments like an installation tester (for example the Beha-Amprobe ProInstall Series). • PE Pre-Test: With this safety feature the PE conductor can be tested for possible presence of dangerous voltage against earth. • Proximity Pilot (PP) state “Cable Simulation”: With PP State rotary switch the adapter can simulate various current capabilities of charging cables. • Control Pilot (CP) state “Vehicle Simulation”: With CP State rotary switch selector various charging states can be simulated. • Measuring terminals L1, L2, L3, N and PE to connect test device like installation tester to perform safety and functional tests. • Terminals for CP signal output to check communication between adapter (=simulated electrical vehicle) and charging station. • Separate phase indication by three LED lamps for easy check if voltage is present. • Mains socket offering the possibility to connect an external load to check if the electric power meter works and counts in the right manner. With a combined experience of over 100 years, well-known German brand Beha and US-based Amprobe have a track record to be proud of. Now we have joined forces, and together we are committed to making your job safer, faster and easier than ever. Our expertise is legendary. Almost 70 years ago in 1948, we invented the very first clamp meter, and we haven’t stopped innovating since. 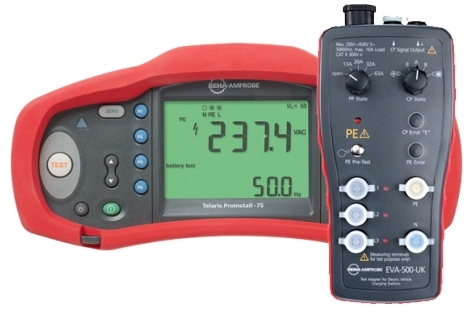 From multimeters to voltage detectors, at Beha-Amprobe we constantly improve our designs to provide you with the very best quality tools and support. The Amprobe brand has always remained a staple among our stockholding. It's pedigree and price point make the brand a quality offering that rival higher priced brands for comparable technology. You can trust Amprobe, thousands do. MI 3152 EurotestXC is an instrument from the new generation of Metrel’s multifunctional measuring instruments. A wide range of functions is included: from on-line voltage monitoring, phase sequence testing and varistor testing.